Sardar Sherbaz Mazari is a veteran politician of Pakistan. He endeavoured to write the story of his political life in a book. He managed to author one of the most critically acclaimed autobiographies in 65 year old history of Pakistan. A journey to disillusionment, the title of the book, truly reflects the main premise of this book. Mr. Mazari has openly discussed how He has been disillusioned by Pakistani politicians. This book is fascinating from start to finish and absorbs the reader completely. This masterpiece was first published by Oxford university press in 1999. This book is unique in a sense that Sherbaz Mazari has told his story to his son Sheryar Mazari, who has actually written the book. However the manuscript of the book was rechecked by Sherbaz Mazari before it was published. Mr. Mazari has divided the book in 12 chapters according to the different phases of his political career and history of Pakistan. One interesting thing about this book is that author has dedicated it to the leaderless people of Pakistan. This is a conclusion that he has reached after spending three decades in political arena of Pakistan. He is quite right in his assessment and Pakistani nation has never had any good leader. Sardar Sherbaz Mazari was born in Mazari tribe's chief family in 1930. He received education from prestigious institutes such as Aitchison college and Royal Indian military college, Dhera Dun. He helped the fleeing Hindu emigrants to safely reach India in 1948. Mr. Mazari started performing tribal chief duties in 1950. After spending years in Karachi and his tribal home in Rojhan, He entered politics by supporting Fatima Jinnah in presidential polls of 1964. He was elected to national assembly from his local constituency of Rojhan in 1970 as an independent candidate. During the civilian autocratic rule of Z.A Bhutto, He joined UDF and then became the founding president of NDP when NAP was banned in Pakistan by supreme court at the behest of Premier Bhutto. He happened to be one of the key leaders of PNA movement in 1977. After the ouster of Bhutto government, He was among few politicians who didn't support Zia ul Haq. He was also a prominent leader in MRD in 1983. He retired from active politics after losing to an IJI candidate in 1988 elections. Mr. Mazari has discussed the history of Baloch nation and his tribe in vivid detail. He has highlighted few important historical events such as Emperor Humayon seeking asylum in Balochistan and Bugti tribesmen used by the British to fight HURS of sindh. One of the most interesting incident revealed in this book is How D.G Khan and Rajanpur were acceded to Punjab by the manipulation of bureaucracy, whereas actually these two districts historically were part of Baloch state of Kalat. This book also tells the story of Sikh conquest of Punjab and how they didn't face any resistance from people of Punjab. Mazari tribe and its adventures also take a lot of space in the initial chapter of the book. This book can be considered as a comprehensive account of political history of Pakistan. It throws lights on all the political developments in 1950s to 1980s. Author writes his experiences and first hand accounts of political developments in the politically disastrous decade of 1950s. Mr. Mazarai recalls how Khawja Nazimuddin was dismissed and how Malik Ghulam Mohammad dismissed National Assembly when he feared reduction in powers at the hands of assembly. Justice Munir chief justice of Federal Court (Now supreme court) upheld the decision of Malik Ghulam Mohammad about dismissing National Assembly, this event is considered as the turning point in history of Pakistan by author in this book. Fall of Dhaka is one of the tragic events in the history of Pakistan. This book is rich in information about the events leading to that disaster. Author has systematically linked up many events to present a case about how east Pakistan was lost. Author holds Bhutto along with Military Junta responsible for the debacle . Mr. Mazari reveals that after January Yahya Khan was a symbolical leader and his deputies had actual control of Pakistan. Mr. Mazari also points out that Mujib didn't keep his promise with Yahya that he will negotiate on his six points. By reading this book, students of history can conclude who caused the breakup of Pakistan. Balochistan resistance movement of 1970s is one of the main topics of this epic book. Author writes how the movement started and passed through different phases. He also unveiled the brutalities carried out by Army against the innocent Marri Tribesmen. He has held Bhutto responsible for all that Mess, because Bhutto started Military Operation within two years of fall of Dhaka. Mr. Mazari remembers his visits to Balochistan during that period as a member of the National Assembly's committee on Balochistan. He recalls actors were brought to welcome them wherever they went in balochistan. Those actors chanted slogans in favour of Bhutto and against Baloch leaders. Mr. Mazari also narrates the accounts of Bhutto's meetings with jailed Baloch leaders i.e. Attaullah Mengal, Khair Buksh Marri and Ghous Buksh Bizenjo. Author highlights the protest rallies which He led in Balochistan against the brutal operation going on to suppress the people who were demanding there rights. This book despite being a masterpiece has some shortcomings. In this book Mr. Mazari has not pointed out a single mistake made by him. He has justified all actions taken by him. Humans are bound to make mistakes and its not possible that He has never made a single mistake in his political career. So this book suffers from the accounts of self justification and glorifying the author. Author has criticized all his political opponents, held them culprits and completely bailed out himself. This book only gives space to one side of the story in many cases and not writing about the other side which is not justified. Despite its shortcomings, its an epic book which is written once in a decades. Its thoroughly researched and there are a lot of endnotes at the end of every chapter which solidifies the authenticity of the book. Not only its a source of historical information but it also flashes reader back in the past and the readers feels that everything written is happening before him. This book earned positive reviews from many international newspapers and critics and its recommended for any person enthusiastic about reading authentic history. 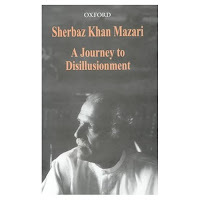 Mr. Mazarai has reflected his disappointment in the book about how the things have shaped up in Pakistan since its inception and he holds the corrupt, vision-less and insincere leaders of Pakistan responsible for it.